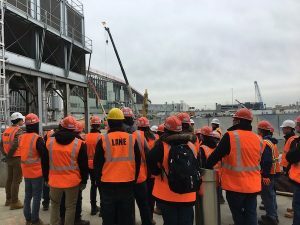 Tuesday afternoon the University of Illinois’ Global Leaders traveled from Brooklyn out to LaGuardia Airport to tour the ongoing construction on the New York airport’s Terminal B. We were briefed on the project by a team of Walsh Construction project managers. 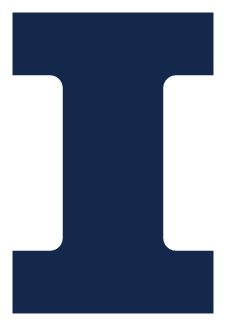 Former Fighting Illini Hector Perez led the group and was assisted by former Global Leader Louie Savandal. 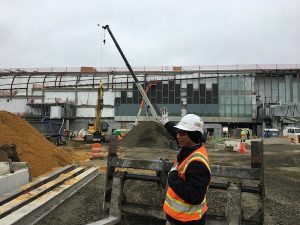 The reconstruction of Terminal B is a joint venture between Skanska (70%) and Walsh (30%) and will cost about four billion dollars. It can be broken down into two sections. 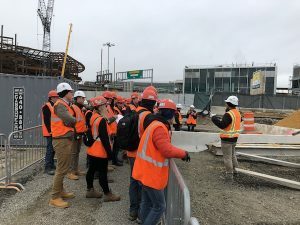 The majority of the work is included in a Public-Private Partnership ($3 billion), while a smaller part of the scope is part of a design build contract ($1 billion). Construction began in 2016 and is scheduled for completion in 2022. Perez noted that the ribbon cutting ceremony will coincide with the Iowa caucus and a very likely presidential run from NY governor Cuomo. The LaGuardia project is a large part of Cuomo’s $100 billion plan to overhaul infrastructure in the state. Due to its high level of political importance, the project executives meet with Cuomo’s staff on a weekly basis. Additionally, each day that the project runs late will cost the Walsh-Skanska team $267,000! The scope of work centers around Terminal B’s head house. Concourse A and B will be built to one side and will be reached via bridges that run over the taxi way. Also included in the project is a parking garage, road network, central hall, and a central heating and refrigeration plant (CHRP). Here are some key statistics to show the scale of the construction. 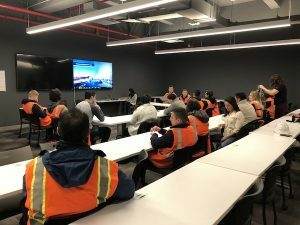 There will be eight miles of newly constructed roadway, nine miles of baggage handling systems, and three million square feet of asphalt and concrete. Over 40,000 tons of steel will be used and more than 7,000 piles will be driven. 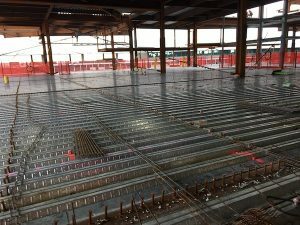 As of March 2018 a quarter of the steel is in place and 35 Olympic swimming pools worth of concrete have been poured. 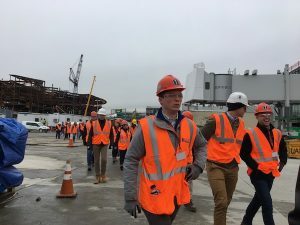 It’s interesting to note that the Walsh-Skanska team would be the 22nd largest DB firm in the United States after doing $978 million worth of work in their first 12 months. A huge workforce is required to complete such a large amount of work. Currently there are about 375 management staff members and 1,300 craft workers. That is a ratio of 1 to 3.5, which is abnormally high for a construction site. Hector Perez explained that this is necessary due to the logistical complications presented by the project. He mentioned that the amount of craft workers will rise as the project approaches summer. At its peak the project will have up to 1,800 craft workers on site. In terms of sustainability the Terminal B project is expected to achieve a LEED Gold certification. It is also expected to gain a NYC Platinum ENVISION rating (62%). 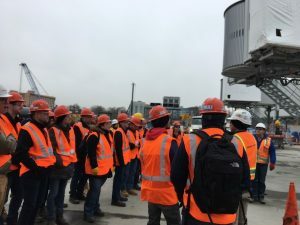 The level of sustainability can be credited in part to the Walsh-Skanska plan to divert 99% of their waste away from landfills, and to recycle 100% of the steel that they demolish. It was great to hear that the team is making a concerted effort to reach out and improve the community around them while the construction is underway. Walsh team members mentioned some of the many ways they are giving back, including participating as judges at a community STEM competition. They are also partnering with a local little league baseball league, and they will be donating $2 million towards a new athletic complex.